Renting vs Owning Your Home – Which Makes More Sense? Most of us were probably raised thinking it’s better to own than to rent. Why would you throw your money away each month, paying off someone else’s house, instead of owning a home yourself? Buying a house was part of the life plan we were taught to follow. Go to school, get a job, buy a house, get married, have kids, retire, die. However, in recent years, especially in metropolitan areas, there has been a growing debate that renting is a better financial investment than buying. Search ‘Renting vs Owning’ on Google. 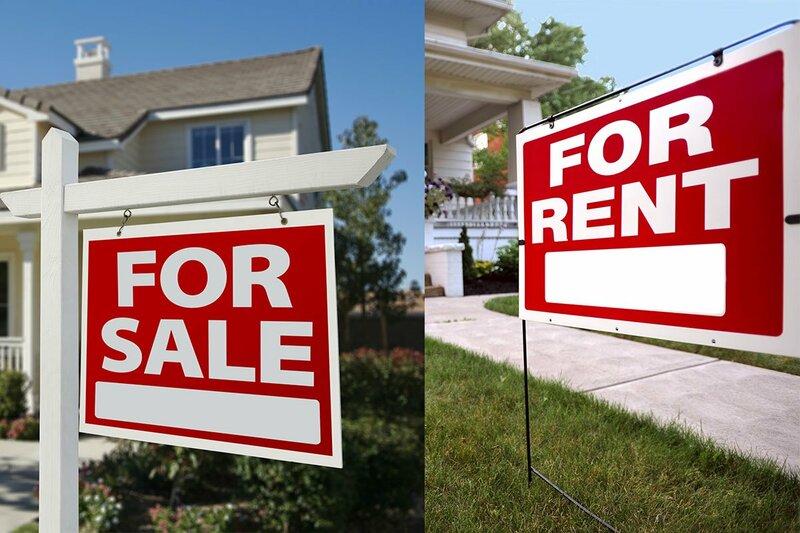 You’ll find article after article that talks about how renting is better than buying. The truth is that it isn’t as cut and dry as we were once told, or the way many of the articles on the web would lead us to believe. The profitability of renting versus owning is determined by the local market and a few personal factors. Sometimes renting is inevitable. Odds are when you go to school, or when you start your career, you’re going to rent. You’re won’t have the savings or income to support homeownership when you start out, so you need to rent. However, for a lot of renters, this is meant to be temporary with the goal of saving to buy. Now, more and more people are choosing to rent for life, or at least past the point where they could be homeowners. The case for renting instead of buying assumes it is cheaper to rent than to be a homeowner and the savings from not paying a down payment, and the savings from lower monthly expenses are put into an investment that can generate a higher return than a home will. This is possible, especially in a city. Renting a condo can be significantly cheaper than buying one, leaving you with an excellent monthly savings. If you take the money you would have spent on a down payment and the monthly savings and invest it into something with a solid return, you can make more money than you would from buying the condo, depending on the housing market and appreciation rates. How permanent of a dwelling is this home? If you’re planning on living in the home for the long term, then owning may make more sense. However, if the place is a short-term residence for you and you plan to sell in a year or two, you will probably lose money by buying. That’s because it is expensive to sell a house. You’re paying commission to the real estate agents and lawyer fees. You can make money on a home over time, which will cover these expenses, but unless homes are appreciating at a high yearly rate (like they were in Southern Ontario for the last few years), you can lose money after the closing costs. Another factor in short-term home ownership is if you need to break a mortgage contract. Depending on where you’re moving/buying after selling, you could face a penalty for breaking that contract. There are people who will continue to rent because they can’t and probably never will be able to afford to purchase a home that suits their needs in their desired neighbourhood. Few people can afford to buy a family home in Toronto. That means they either need to rent or move outside of the city. Well, for many, relocation means a daily commute back the city, because there are a lot of jobs in large cities that don’t exist in smaller towns or the suburbs. Your time is valuable, so it has to be taken into account when calculating if it is worth buying something that means extra travel time. How large is your down payment? What are the monthly carrying costs for the same home as an owner compared to renting that same unit/homer? What are historical appreciation rates for similar homes in that area? What return can you get if you rent, save, and invest? What closing costs will you have when you move? Renting and investing in something other than homeownership may have a higher appreciation rate (not a guarantee), but that doesn’t necessarily mean you’ll make more money. When you invest your savings, you only see a percentage of growth from the money you invest, while a home appreciates based on the total value of the home, not just what you’ve put into it. You have $100,000 to invest. You either put 20% down on a $500,000 house or you rent and you invest that $100k in stocks. As a homeowner, your $500,000 home appreciates at 4% a year. After five years, the home is worth $608,326.45, a $108,326.45 increase. As a renter, your $100,000 is invested in stocks and sees a 6% yearly appreciation. After 5 years you have $133,822.56, a $33,822.56 increase. So, while the stocks have a higher appreciation rate, you’re not making as large of a return on profit. As a homeowner, to sell your home and pocket that appreciation, you’re paying closing costs. Closing costs aren’t cheap as a seller, but even at 7% of the sale price ($42,582.85), you’re still profiting $65,743.60. That’s almost double the return seen by the renter. Now, this is a simplified scenario. There are many variables you’ll have to calculate. The duration of the home ownership/renting, along with appreciation rates, and the difference in monthly expenses will all play a role in determining which choice is more profitable. Different towns, even different neighbourhoods within the same city will vary in costs and appreciation values. It’s important to do homework based on your specific situation to determine which is a better decision for you. A local realtor is a great resource to help identify local prices/rents, as well as providing insight into appreciation value for a specific neighbourhood. Many have described home ownership as forced savings. To own you have to save for a down payment, and then each month you are “saving” as you’re building equity in your home with each mortgage payment. With renting, even if it is significantly less expensive and you’re able to save money each month, are you doing anything with that money? The case for renting requires you to actually save money each month and to do something with it that earns you a return. The danger comes when the money just sits in your bank account, losing value as the dollar depreciates. Worse yet, you spend your savings. With extra cash in the bank, it’s easy to say yes to a shopping spree, travel, and dinners out. You don’t want to get into the habit of spending all of your earnings. If you ever plan to stop working, you need to do something to generate income for your future. You may find that renting is cheaper for you where you live, but that doesn’t mean homeownership is ruled out for you. It’s becoming more common to find people who rent in the city but own an investment property elsewhere. Assuming you can find an investment property where the rental income is greater than the monthly costs associated with the home (a positive monthly cash flow), buying a home in a neighbouring community can be a great way to invest your money for your future. There are too many factors to saying renting or owning a home is the better decision across the board. It’s important to look at what’s right for you and your circumstances, and no matter what, make sure you’re doing something with your money to provide income for your future.